On the Western Coast of the Yucatan, fully licensed, owned, operated and guided by locals since 1999, with an uncomparable knowledge of this challenging shallows and serious commitment to provide quality of service to avid anglers. TARPON TOWN ANGLERS is based in the Magnificent city of Campeche and the fishing grounds are well know as The Tarpon Coast, Tarpon Route, Bahia del Sabalo and other names. Feel free to surf our website where you surely will find what you are looking for your next fishing trip. Visit the Reports & Comments section and the fishing PICS AND VIDS Galleries of our happy clients. We can accommodate from groups of any size to single anglers, with or without none fishing companions. If you have a large group willing to experience this ULTIMATE FLYFISHING SPECIE, contact Us inmediatly to guarantee availability and/or to build a custom itinerary with additional activities when off fishing. Thanks for visiting and we hope to fish with you soon. Please allow a few days and come back to check the latest version of our new website. Where is Tarpon Town? Is it a remote spot? Our business, Tarpon Town Anglers is based in the city of Campeche which is in the west of the Yucatan, facing the gulf of Mexico. To make a reference, 5 hours from Cancun across the peninsula but going westwards. The city is a fully charm colonial town with authentic traditions. Why going remote if you can have all amenities and great fishing in the same place? Campeche Airport CPE is served from Mexico City with Aeromexico Airlines and partenrs. Merida Airport MID and Ciudad del Carmen CME are served by United Airlines thru Houston IAH . There is an option to pick you up at Cancun Airport however, a surcharge for private shuttle may apply and driving time is five (5) hours. We fish year round as fish are resident. Winter and Spring bring more samples of larger Juveniles in decent size schools to the game. The babies are happy as far as weather cooperates and coldfronts are not blowing. Summer and Fall are the steadiest as the rainfall flushes the mangrove with nutrients into the Gulf, generating more happy brackish water. It is the hurricane season. Do not worry too much. We don´t get as many as the caribbean waters. If I go fishing all day, what could my non-fishing companion do? As all guests are staying within the city, either downtown or a few steps out, there are many activities and sightseeings for non angler companions such as museums, handicraft and supplies market, ecotours, birdwatching, half day trip and full day expedition to mayan ruins, beach days at private waters, new 9 hole gulf course and much more. What are the Rates and How do I Book my trip? Rates varies depending on the number of fishing days / nights you decide to stay. The advantage of not having to stay a minimum of nights lets you build an itinerary according to your vacation length. Check rates clicking here . In order to book your fishing trip, follow this easy steps. 1.- email us your probable dates, number of people and general plans. 2.- We will confirm availability and will send you payment instructions. 3.- Send your party´s flight itineraries… and all set. We´ll pick you up. Daytrips Available if you are already in the area. How do I get in touch with Tarpon Town Anglers quick? The easiest and most convenient way to get in touch with us is via email so we can keep a track of your inquires. However, you can reach us by phone dialing (+521) 981133 2135 (Some areas need to swap the + with 011) if anything urgent comes up. The downside is that if we are fishing,we don´t take calls until later in the evening. Filling up the form on the contact page is good option too, Expect a reply within the next 48 hours. > Having fished all over the world, I have a “keen understanding of quality”, or lack thereof ! Your operation is like a “well oil machine”, with all the parts working wonderfully! Juan is the best guide I ever had. Ralph B. As usual the guides were fantastic and Fernando was really patient with my casting and flubs. The only thing I would have liked better was time to have a beer with the guides at the end of the last day. You have improved the overall quality of operation and it makes it a pleasure to fish with you. I want to thank you for a fine trip to Campeche. It was a great time and we are back at home now. > I go because I like the total experience, where you are, who you are with, what are the surroundings, seeing new things, getting ready, tying the flies, and Your approach to hosting a trip embodies all those things. Thank you for an enjoyable trip. 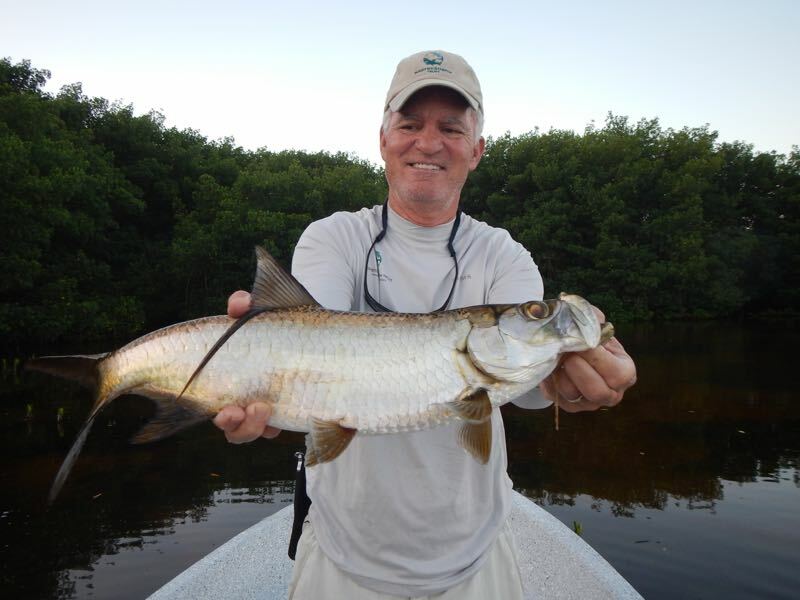 I had a great time fly fishing for small tarpon at Campeche. Caught my first tarpon ever! Very exciting fishing. Everything went smoothly—things were well-organized and the guide was very helpful. I learned a lot from him about tarpon fishing. The hotel was great and that area of Campeche was beautiful---it was wonderful area for my wife and I to explore. I’m definitely ready to give it another try! 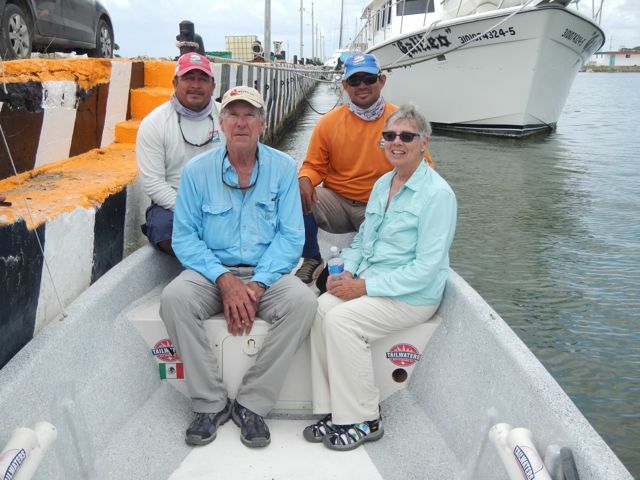 Thanks for a wonderful time fishing and visiting in Campeche, both Joe and I enjoyed ourselves and have already been highly recommending Tarpon Town as a first class destination for juvenile Tarpon. I have been fishing with Tarpon Town Anglers since 2012. Raul's attention to detail and customer service is one of the best that there is in the sport fishing industry. 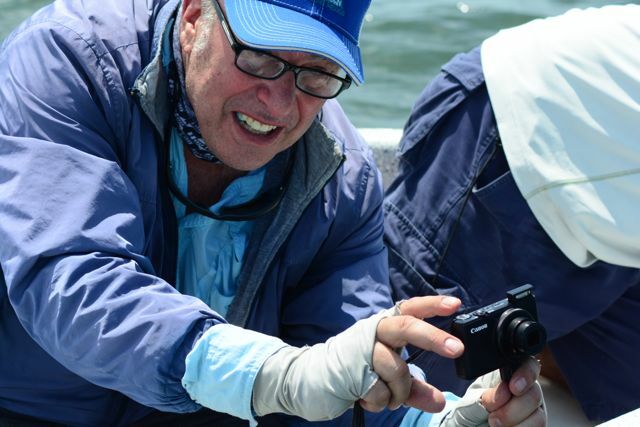 Guides are very good at helping anglers spot tarpon and get them set up for the best cast. Rooms are very clean with a great staff of helpful people and next to the marina. Campeche is a healthy , sharp clean and extremely safe city at any time of the day. Bobby C. and Ed G.